One of the biggest reasons people with arthritis don’t heal is that they have never heard of anyone else who has. They don’t even imagine it is possible. 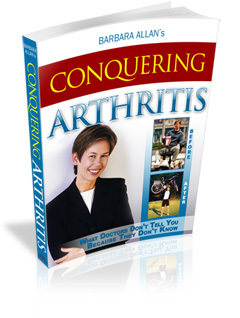 If you have benefited from one of my Conquering Arthritis products: the book, the DVD, the guided meditation CDs, the online video coaching course, or direct one-on-one phone or email coaching with me, one of the most valuable things you can do to “pay it forward” is to share your own personal success story. I would love for you to share with me your story so that I can share it with others. Particularly powerful are details like how much your blood work, pain levels and functioning has improved. Sharing these details along with what the most important factors have been in your improvement can help others realize that it is possible to heal. If you have gotten completely well, of course, I want to hear from you. If you have experienced any level of improvement, I would still love to hear from you. Please submit the form below or leave a voice message detailing your success on my phone line: (623)850-1360 (Allowing others to hear your story in your own voice is a particularly touching way to share your story). In 1999 I was diagnosed with RA after quickly progressing to feeling pain in all my joints. After an initial nightmare of the first MD telling me to come back in 3 months, I found a Rheumatologist who started me on meds. A friend heard of Remicaid early on, and for nearly 10 years I received infusions every 8 weeks. Luckily, at the time when I could no longer afford the Remicaid infusions, I was given the name of a Naturopath who diagnosed me with a corn sensitivity. For a year I cut out all corn products, big and tiny ingredients. I didn’t eat much processed foods so it was relatively easy to go back to basics. After the year, I went off the meds….It’s going on four years now! I am nearly pain-free. If I get achy, I stop whatever food irritates my joints (no corn still, potatoes, tomatoes, breads). Your book certainly helped support my efforts personally, and better still, I passed it on to my dad and another friend.